Of course, you are going to love your little guy no matter what profession he goes into: he may become a highly-skilled doctor or a modern dancer; he may go into agriculture or graphic design or environmental law. But for today, he’s a plumber, your little plumber--everyone’s favorite plumber in Mushroom Kingdom, that is! 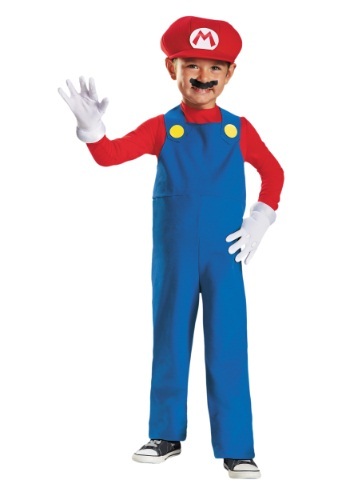 It seems like this Toddler Mario Costume is a natural fit for your tyke. He's always running around and stomping on stuff, so why not make it Goombas? And if he’s going to be into heroic dramatics (as all toddlers inevitably are), why not have him channel that energy into rescuing Princess Peach from Bowser? And if he insists on racing his toy cars all over the house, you may as well just teach him to ride a go-kart and race all of his friends! Mmmm. On second thought...maybe table that idea for a few years (or decades). The point is, your little guy has a lot of powerful energy and seemingly endless lives. Rather than try to turn him into something he’s not, let his frenzy become an asset (to the gaming world, at least). The jumpsuit is styled as Mario’s classic blue overalls over a brick-red shirt and the gloves are stuffed to appear oversized, so he can really get into character. No Mario would be Mario without his signature "M" hat, included, but we suggest picking up a mustache ASAP before your little guy tries to draw one on himself in permanent marker. Maybe he’ll repay you someday by putting you up in one of the many castles he conquers, you know, as a thanks for supporting his dreams!